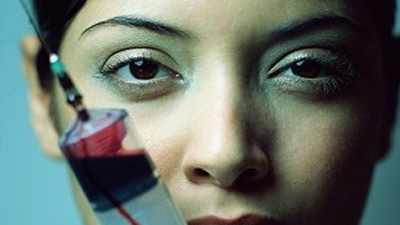 Blood Therapy: Doctors Use Blood To Make You Look Younger? We all know that doctors use blood to save lives, but did you know that it can now be used to make you look younger… like a vampire? Thereâs this new procedure that it is utilizing a patient’s own blood to produce a mixture that stimulates collagen production, which results in fresh young looking skin. Apparently Elizabeth Bathory was just a few hundred years before her time… sorta. “We’re only talking about a small amount,” says Dr. Andre Berger, Medical Director of the Rejuvalife Vitality Institute, one of the few facilities that offers the blood therapy (also called âDracula Therapyâ). Now time to get all scientific on your asses – SELPHYL is a patented system for the safe and rapid preparation of Platelet-rich Fibrin Matrix or PRFM. Hereâs what happens, a plastic surgeon or dermatologist would collect a small amount of your blood and through the patented process, separate and concentrate the platelets and fibrin. The resulting PRFM is then applied to your face, hands, buttocks or breasts to rejuvenate and increase your skin’s volume. The entire process takes about twenty minutes with no post-procedure downtime. Sounds way better than that paralyzing botox, huh? The good thing about it being you own blood is that the mixture does not contain any animal or synthetic components, so there is a very low risk of an allergic reaction. “It’s a natural approach. In other words, these are not adding volume, this is stimulating your own body to thicken and rejuvenate your skin naturally” says Berger “So you’re not adding an unnatural, synthetic substance to do the job. You’re using your own material”. The doc goes on to say that patients will see a subtle and natural improvement, which is ideal for those who dislike synthetic products. He adds that a patient will start to see results in three weeks, when the fibroblast cells start pumping out collagen, whose effects will last for many months. How much does the âDracula Therapyâ cost? You can find out more about this blood-filled procedure at the SELPHYL website. Dr. can u be precise and tell me how long the person is going to live when pass through the following procedures?